Yesterday, it was suggested that I list the top five Super Bowls ever as my Friday Five. I didn't, but I did surf the web to find a list of the top 7 Super Bowls of all time as compiled by Rush Magazine. It's a pretty decent list, so I'll post it here and then make a few comments. To be fair, here's how Rush Magazine justified their number one choice. If you've ever been amazed at what you just saw in a football game, you can relate it to this dandy. It didn't end with a miraculous play, and there isn't some overwhelming statistic that you can hang out there that will never ever be taken down... but holy Lombardi's, this was the birth of football. Broadway Joe, calling the win. Calling the win, against the mighty Colts! It just wasn't going to happen! If you were around then, you'd remember thinking what an idiot this man was to be not only digging his own grave, but bringing a bathtub and a toaster with him. You then watched in head-shaking, head-numbing, head-warping disbelief as you gradually understood that he was going to pull it off. He knew. He just knew. And after that game, we all knew. In my humble opinion, nothing has surpassed Super Bowl XXXIV in terms of pure excitement. 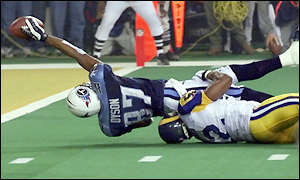 The Tennessee Titans trailed the Kurt Warner and the St. Louis Rams by seven with six seconds left in the game. Steve McNair was in the red zone, 10 yards from a tie score and overtime. The pass was to Kevin Dyson whose outstretched arm fell a yard short as time expired. I remember watching this one at a house party and you could hear a pin drop during this final play. I think there was a unified "F*ck Off" or "No F*cking Way" when we realized Dyson missed it by this much.